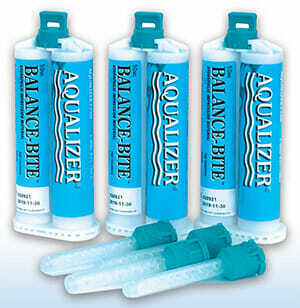 Balance-Bite Registration Material directly from Aqualizer. It is the perfect companion product to use with the Aqualizer Bite Registration Technique, or any other Functional or Centric Relation Bite Registration Technique. Remains dimensionally stable for accurate articulation of models. A syringable vinyl poly siloxane material for achieving highly accurate and detailed bite registrations.